NT Thunder is looking forward to playing big games at home after today’s announcement of the 2019 NEAFL fixture delivered a number of highlights for the competition’s only NT-based team. View NT Thunder’s 2019 NEAFL fixture here. The season, which gets underway on Saturday 6 April, is set to go off with a bang when the Brisbane Lions make the trip to Darwin. Following Thunder’s thrilling one-point victory over the Lions in Round 1 last season, they’re just one of the four AFL-affiliated NEAFL teams that promise a good show when they head north next year. 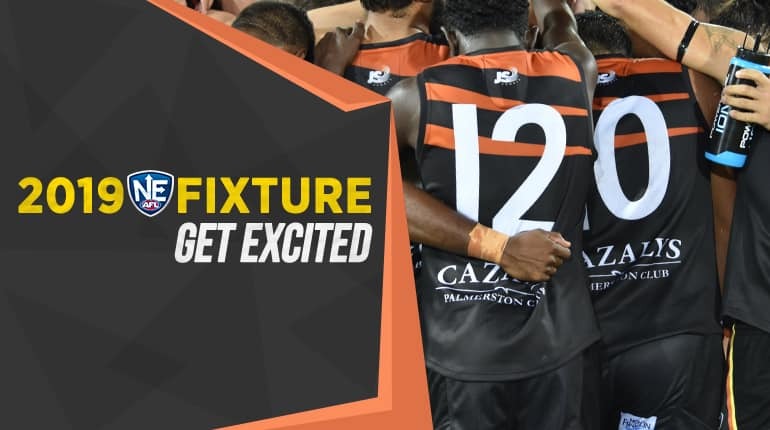 Thunder’s growing Central Australia fan base is also in for a treat when for the first time since 2013, the team will play multiple games at its second home in Alice Springs, in Round 12 against Aspley (22 June) and then again in Round 17 against Redland (27 July). That’s just one of three big games in three different locations that Thunder will enjoy against the Redland Bombers next season. The first is the traditional ANZAC Round showpiece when Thunder travels to Brisbane in hopes of regaining the day’s top honours. And the second will be a great spectacle for fans in Round 9 when Thunder host the Bombers in an afternoon curtain-raiser game to the Melbourne vs Adelaide Crows AFL game. The NT boys will also come up against the reigning premiers, Southport, on three occasions; once In Darwin and twice on the Gold Coast. Manager of NT Thunder Andrew Hodges said the fan in him was getting excited while it was also a favourable fixture for the team. “The NEAFL has worked hard to accommodate all the clubs’ requests, and we’re fortunate to land with the majority of our games at home, which are well spaced with the trips on the road. “Coming off a heavy local season with the NTFL the players won’t have to wait too long for a rest, their first bye is scheduled for the Easter long weekend which will allow them to prioritise family time, a value held firmly by the boys. “There is a lot to like about what’s ahead in 2019. Two games in my hometown of Alice Springs, all the AFL aligned teams coming to Darwin and playing on the big stage before the AFL,” he said. Hodges said today’s announcement was another checkpoint on the road to 2019 reached. “On Monday, we announced Darren Reeves as Head Coach, today the fixture is out, and next Monday is our first pre-season training session so it’s all coming together nicely and we look forward to announcing more player signings in the coming days,” he said.